His efforts resulted in the new Tom Ford Private Blend Jardin Noir Collection, with four fragrances ($195-$475). He ruined me - I had to have most of them. Three are gorgeous. The Jardin Noir Collection has arrived at the stores that carry Tom Ford, and they are attracting their fair share of attention from perfume aficionados everywhere. Jonquille de Nuit, a white floral-narcissus blend. A "high-definition portrait of female self-obsession." Huh? That's an odd description coming from a designer who is as self-obsessed as any I've seen. Jonquille de Nuit is a gorgeous fragrance, characterized by its key notes of narcissus, violet absolute, mimosa, and orris. I purchased it. I love it. I can smell real jonquilles on first spray. It's spring - it's not dark. 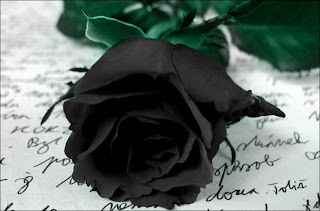 Café Rose is the dark one. It's a woody rose. "an unexpected twist on classic elegance." The key notes are rose oil, coffee essence, incense resin, and patchouli oil fraction. One of the Tom Ford counter reps told me it also has oud (agarwood) in it. From the moment I smelled it, I disliked it. I am dead-sure it did not share the same perfumer with the other three (now, really, you don't think Tom Ford designs these fragrances himself, do you?). To my sensitive nose, the patchouli, a note I can't tolerate if I can smell it, takes over and strangles the rose in Café Rose. If you like patchouli and that woody base in your fragrances, you may like it. I found it the odd one out in this series. Lys Fume is my favorite among beauties. It is a white floral with just a hint of spice. "A narcotic twist on the innocent lily flower." It had been code named Me!Me!Me!, and I was sure the code name sent me a signal that it was indeed all about me (sorry, Tom). The key notes are pink peppercorn (for the pleasant and subtle spice), lily, ylang ylang (for zip), and vanilla absolute. Ravishing! It's like cuddling with a bouquet of Stargazers. 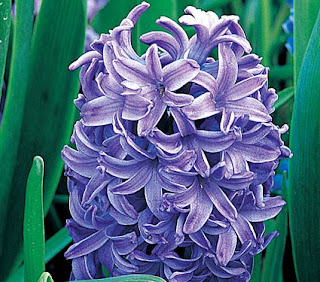 Ombre de Hyacinth is a green floral with a reminder of spring's delicate, fragrant hyacinths. "A fragrant portrait of distant and bewitching beauty." 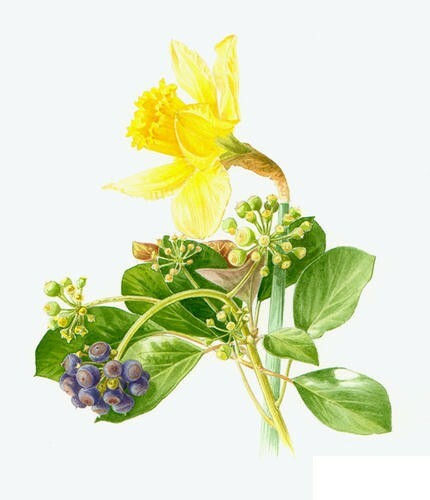 The key notes are hyacinth, violet leaf, jasmin absolute, and Persian galbanum resinoid. This is a very green, effervescent fragrance. I love it, but you must love greens to get comfy with it. Some find them "bracing." I find them fresh. 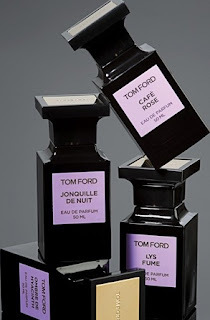 The dark bottles are beautiful and will adorn your dresser or vanity with typical Tom Ford cachet. Despite his racy ads (some of which border on distasteful in my opinion), he has launched a collection to appeal to those of us who love the traditional, floral side of life. It's not dark. To me, it's about light and love. Although Tom Ford's publicity said these four new fragrances would be available in October, you can find them now at Neiman Marcus and Bergdorf Goodman. Have you seen then? 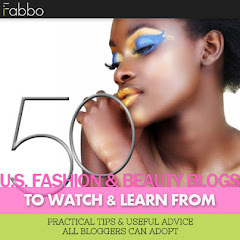 Tried them? Bought one? etwaddhGreat review!!! The bottles are just gorgeous and sultry! I did try all of them at Neiman Marcus and fell in love with Jonquille de Nuit! It was so unexpected, but I literally could not stop sniffing my arm!! This may be a full bottle purchase for me during the NM Beauty Event!! Lys Fume comes in a close second......gorgeous! Will you be purchasing one?!!! Sorry for the above typo in my comment! My apologies! I've tried all four and I find none of them to be dark. The cafe, oud wood and patchouli were totally missing in action on my skin, in the Cafe Rose. 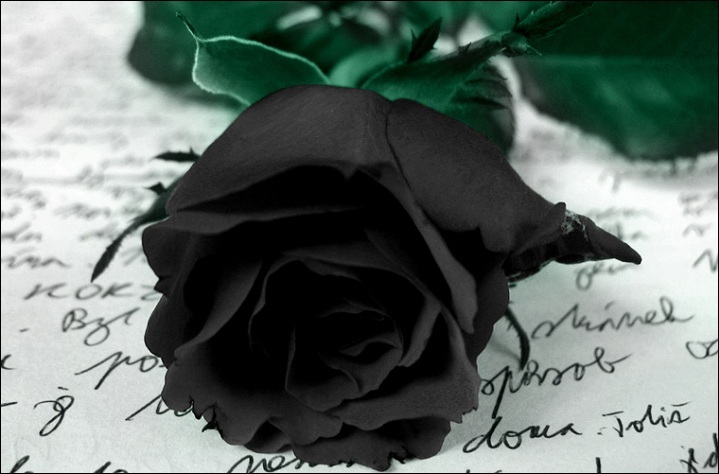 All I got was a beautiful fruity rose. Not bad, but not dark. 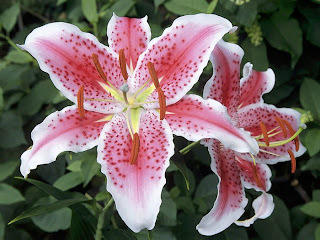 The Lys Fume was just too lily for me to like. Again, nothing smokey or dark. I'm waffling between the Jonquille de Nuit and Ombre de Hyacinth as my favorite. But at $205 for the small bottle, I can wait. Serge Lutens Santal Majascule is my next planned fragrance purchase. Hi Tatiana, at least you know what you like and want. Very cool. I may be a broke college student, but luxury beauty is my splurge and I gasped when I saw these! Neroli Portofino is my go-to so I'm just dying to sniff these babies and fall in love with one. I swear, Tom Ford could put his name on a paper bag and I'd start saving my pennies to buy it! I like his private blend fragrances a lot and I'm curious about all of these, but I have to say that the only one that I think would likely work on me is Cafe Rose. For whatever reason, lighter fragrances just seem to disappear on me. If you like Neroli Portofino, I think a few of these may sweep you away. Sorry for encouraging spending. At least you know your own skin. I'd try them in the store before choosing. Apply one of the lighter ones, then see how long it lasts. Only way to really know.